Freehanded this one the same way I did the dream sequence strips before it. No sketches or thumbnails. Not sure it works as well for the strip's "regular" style as it did for the line-less dream-world. Sometimes I forget she’s just a little girl. So much has happened in her life and sometimes she seems older than she really is. I’m happy to see that she loves & trusts Todd enough to “want her Daddy.” Time kind of blurs in the story though – how long has it been since he first brought her home? Only a couple of days, at this point. First day was when she needed to go to the hospital, so this is (presumably) the second. No, just misread that – I thought he was asking how long since she’d been brought home FROM SCHOOL after the fight. Also, is it just me, or would it have been a bit stronger if the last panel was “I wants my daddies” while she was throwing back the covers? Hmmm, possibly. But if that was the last panel, then we wouldn’t have a closure image to the strip. It’s not really a “punchline” exactly, but doing it this way gives something of visual interest to close the strip on while also leading in to the next one. True – could’ve been resolved by her shifting the covers off to get out of bed rather than an energetic “Selkie Swoosh!” while still sick. Obviously she’s feeling better! Todd adopted her in early-to-mid August, and it is currently early November of the same year. So about three months. Aw, poor Selkie. She’s had to grow up so quickly, it’s refreshing to see her be loved and cuddled like any other kid. I’d love to see more of her and Todd bonding. She’s going to grow up to be a fine woman. I, for one, like the freehand in today’s comic. Feels more dynamic/organic. Might just be this particular strip that makes it feel that way, though, with Selkie all bed-headded. On the art side, I think it looks how it should. Had there not been the note about it being freehand, I probably wouldn’t have known. Also, Cypress Miller is an excellent name for a young celebrity. Exactly the right combination of weird and normal. no, it’s not. there are too many letters, there’s no u, and not enough Ys to be Miley Cyrus. Unless middle names are being taken into account too. I dig the textures on the wall and blanket. I Like Selkie’s taste in pajamas. The cut is practical for providing warmth and the deep red is an excellent colour to bring out the indigo in her cheeks. I’m thinking her fashion palatte must be quite atypical – not your average Winter-Summer-Spring-Autumn! Perhaps the Sarnoth choose between a Marsh-Tropical Ocean-North Sea-Coral Reef palatte instead…. 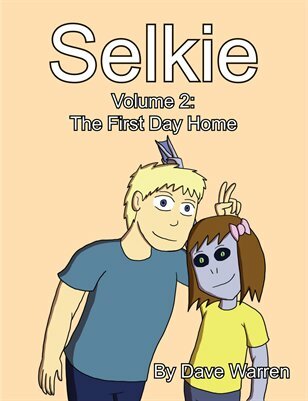 But when a child learns from the start to call her father Dad, https://selkiecomic.com/comic/selkie46/ and after a trauma refers to him as Daddy – especially after only three months – well, I don’t know what it means, but I do find it interesting. Interesting that she´s speaking to herself in Englisch, not Tensei. Why not? 40% of her life has been spent speaking English. And if you consider that kids don’t usually start talking until around 2, 66% of her VOCALIZING life has been spent speaking English. I’m surprised she remembers any of her “native language”. Math error. 50%, not 66. I think it should be spelled “daddys”. I don’t see, why Selkie’s typical trailing s should change the ‘y’ to ‘ie’. I mean, she’s not referring to multiple daddies, or is she? Answer: No, for it to be ‘Daddys’ is wrong, Dave likes grammar/spelling. Thank the Lord!